Christmas at Halwill Manor this year was a day of festive fun and high spirits as everyone came together for a lovely occasion. Residents, family, friends, and staff took part and enjoyed the celebrations in a happy day for all. We had entertainment and activities provided and the day turned out to be a full day of relaxed fun. The craft sessions we regularly run were Christmas themed and residents took part in making decorations. 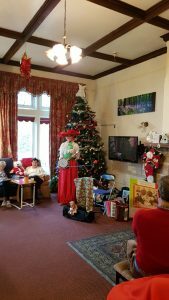 There was a Christmas “Music and Memories” session with Rowena who came in to delight residents and staff alike with her wonderful music, singing and costumes. Christmas at Halwill Manor Is always an anticipated joyful occasion, this year being no exception. We decked the Manor out in full festivities and the atmosphere as usual was warm and friendly, the perfect environment for everyone to enjoy the best day. Christmas day itself was very much a family affair with residents opening presents around the tree with our care staff and families visiting and spending time with their loved ones. A traditional roast Turkey lunch was served with all the trimmings. We were so pleased to see loved ones spend this special time with each other and we all enjoyed Christmas together in the best environment. We take care of your loved ones and we want to give you a memorable and lovely day together. Our goal is to provide the care that you cannot give at home so that you can enjoy your Christmas day without worrying about your loved one’s wellbeing. It was lovely to have everybody together enjoying Christmas, enjoying the entertainment, and making the most of this joyful day. Thanks to everyone for making Christmas special this year!